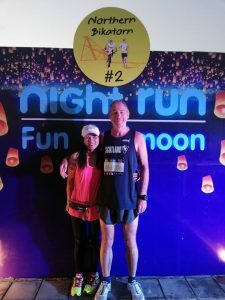 After struggling with a viral infection for months which saw my running performances plummet, I was forced to stop running altogether in mid-September. I really thought that my running days were behind me and began to put a brave face on things by walking around a number of Glasgow parkruns with Jack, my faithful hound. Poor Jack couldn’t understand why he wasn’t allowed to run around the courses as usual but was being held back by me. Almost, as soon as I stepped off of the plane I felt better and have slowly been building up my strength and running ever since. 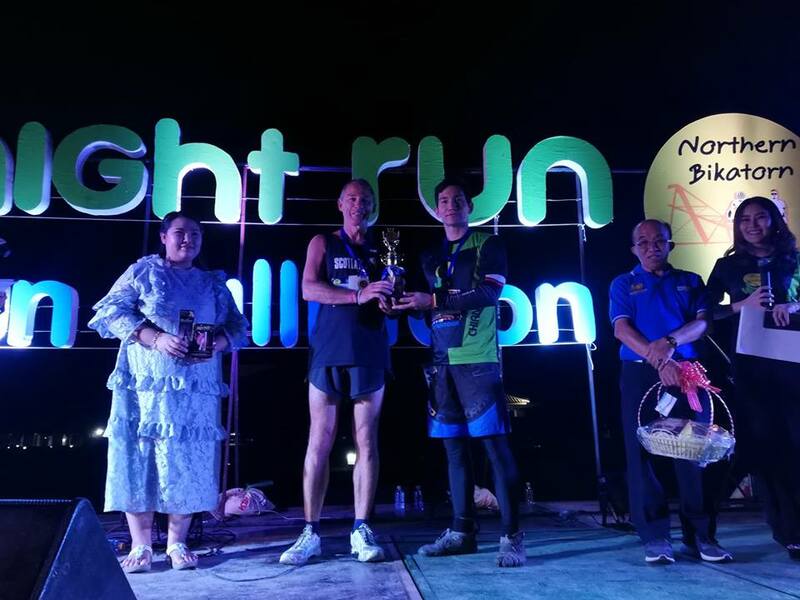 I was planning on competing in my first race in six months in December but as luck would have it, I managed to get a last minute entry to the Northern Bikatorn Loy Krathong Full Moon Mini Marathon (10.5k) Race. 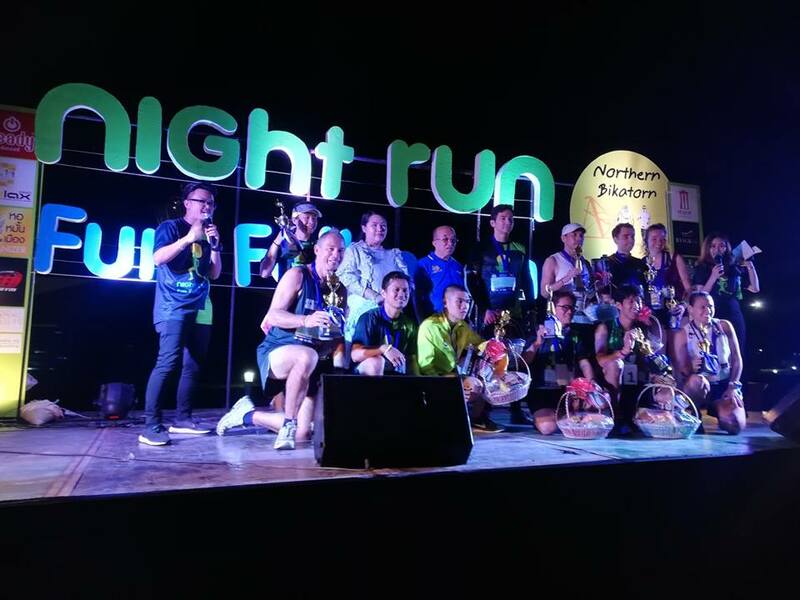 This is an unusual event in Thailand as it is staged at 6:30 in the evening, rather than the usual 5 am. This would also be my first ever run in my new dark blue Scottish Veterans running vest. 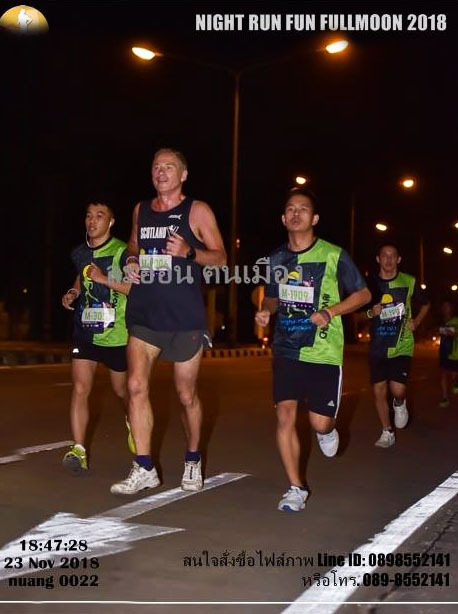 I knew the route well as I train on it and a number of other races are held along the same course. 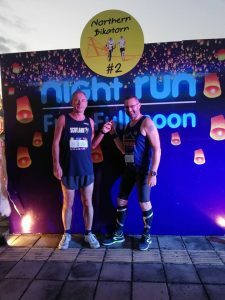 We assembled at the International Conference Centre and as darkness fell we set off up Canal Road to the turnoff for Huay Tung Tao back along the cycle and running paths doing a lap of the 700th Anniversary Stadium on the way. There were a number of water stations and checkpoints on the route but no distance markings. I ran a fairly cautious race in a fairly sparse field catching a number of runners, particularly in the second half. 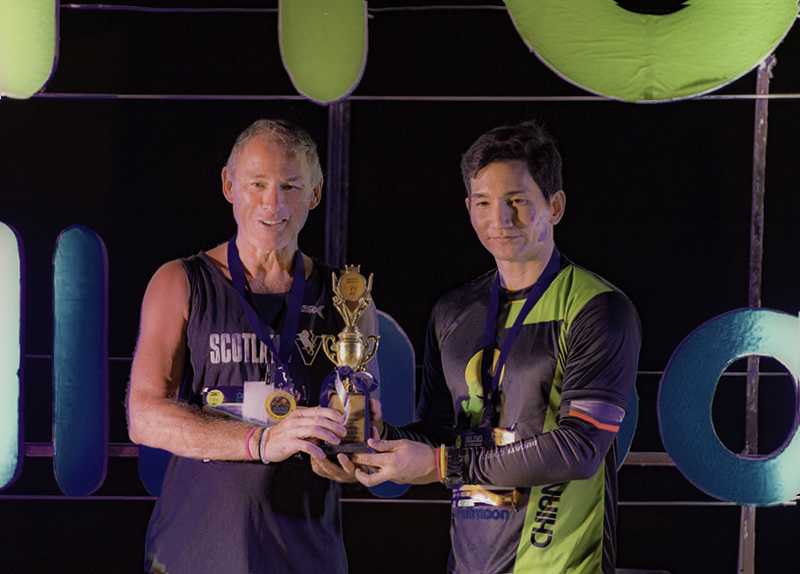 I missed the turning for the final strait, which meant that I had to backtrack a little and then give my all to hold off a challenge from a runner that I had overtaken in the final 2k. 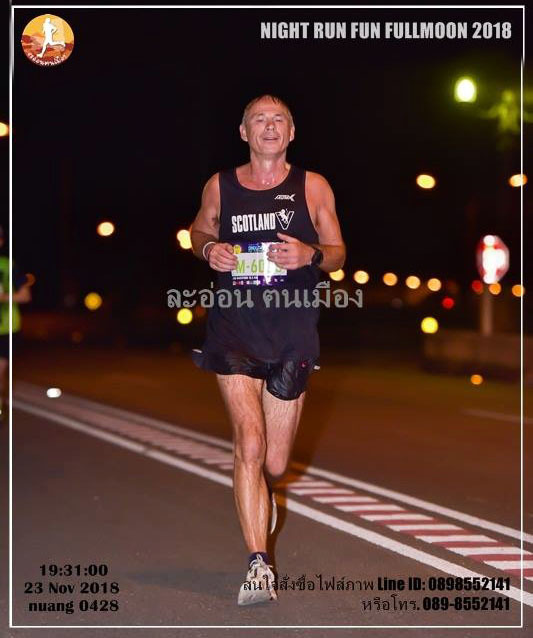 I approached the line to the now familiar sound of ‘hok sip’ being shouted by the organisers who spotted mt Bib indicating that I was in the 60+ age category. 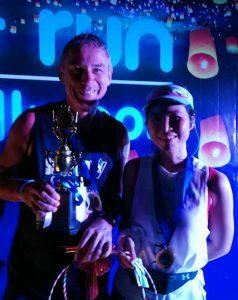 It’s usual for the top five in the various categories to win prizes in Thailand and I had been confident of doing that, I hadn’t been confident of being the 1st MV6o though, so it was a pleasant surprise to have the No.1 placed around my neck as the organisers escorted me across to the winners registration desk. ‘Passport please’ came the request, ‘mai mii’ I responded. 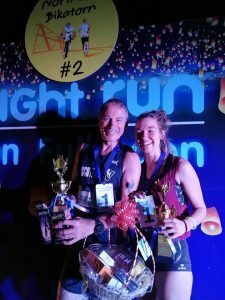 I’m not really in the habit of running with my passport but I was astute enough to have my Thai Driving Licence in my motorbike and trundled over to the carpark and back verifying my personal details. I mingled with old and new friends and helped myself to some food and drink as a rock band played in the background. 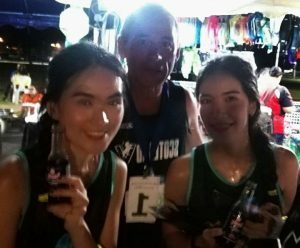 On spotting the No.1 around my neck, other runners offered their congratulations and asked me to pose with them for selfies prior to the official award ceremony. I was surprised to see that they were only awarding prizes to the 1st in each Cat and I was further surprised when they called out my full name ‘Ian Stuart Goudie’, they had obviously used the name from my Driving Licence. I received my Winner’s Trophy, a basket of various products and some skin whitener from one of the sponsors. A few more photos and it was back on the motorbike and homeward bound laden with my winnings. 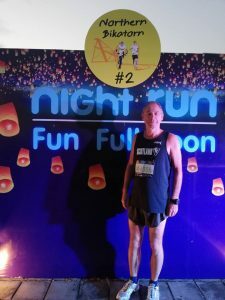 Thanks to all concerned with the event my fellow runners, the photographers and of special note Mark Barron who, as well as having a decent run which saw him place in the top five, also acted as my personal photographer.